From left: Mike Penland, Roberto Guerrero, Lt. Col. Paul Calhoun and Tech. Sgt. Shane Powell discuss flying capabilities aboard a C-17 Globemaster III Feb. 13, 2018. 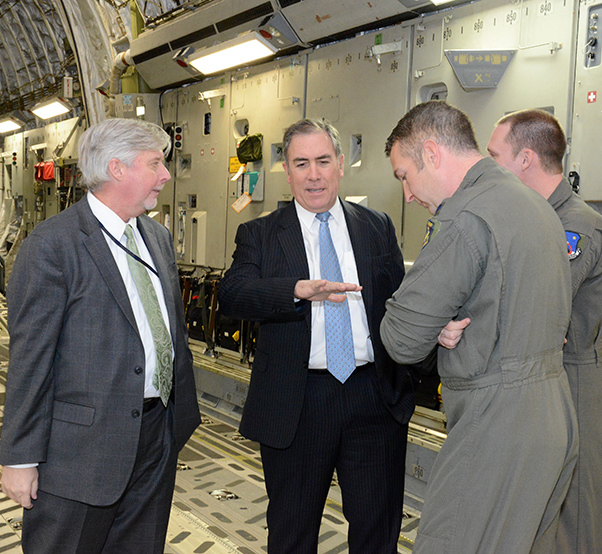 Guerrero and Penland visited the 418th Flight Test Squadron at Edwards Air Force Base, Calif., from Washington, D.C., where Guerrero serves as the deputy assistant secretary of the Air Force for Operational Energy. Penland is the principal director for Operational Energy Policy and chief of staff. The two Air Force executives met with testers at the 418th FLTS to gather insight on past and continuing test efforts to reduce fuel usage and costs, specifically on the Air Force’s larger planes such as the C-17, which according to the Air Force, consumes the most fuel annually. Examples of fuel-saving testing that the squadron has conducted include C-17 drag reduction and synthetic fuel testing. Guerrero and Penland’s office is responsible for providing policy, governance and oversight of Air Force Operational Energy integration into plans, programs, acquisitions and budgets to support and enhance the Air Force mission. 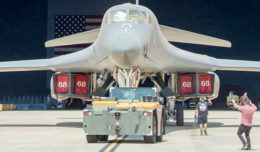 According to their official website, they aim to break barriers by connecting Airmen with technology, data and innovative thinking to develop and champion energy-informed solutions for the Air Force, which includes fuel and energy optimization for the force.